New Lake Wylie projects are underway! Lake Wylie just keeps growing and growing! Several commercial projects have been in the planning stages in the charming Carolina town, and at the Shoppes at the Landing, more construction is finally getting underway. The largest tenant by far, occupying almost 87,000 square feet, will be Morningstar Mini-Storage. With plans to open in the fall, the building will be two to three stories tall and will include interior access to storage units averaging 100 square feet. 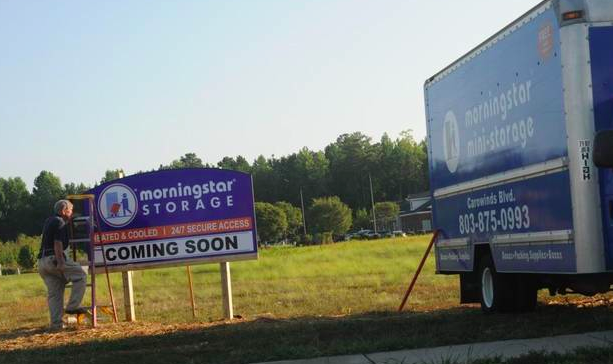 This new Morningstar Lake Wylie location may also include boat or vehicle parking that would be covered or screened.Located at 574 Nautical Drive, Morningstar is taking up a large portion of the 52 acres that make up the Shoppes at the Landing. There are also smaller tenants, though, that are also going to be major players, including Cunningham Waters, which will be 3,500 square feet initially and then followed by another 3,200 square feet at a later phase. Heartland Dental is going to begin construction on a 5,500 square-foot office building, and Wylie Commons is approximately 9,000 square feet. Lake Wylie Pediatric Dentistry, as well as Moe’s Southwest Grill, Sports Clips and TK Nails Spa and Waxing are also moving in. Furthermore, 9Round Fitness Lake Wylie will also be coming soon and will offer a 30-minute kickboxing classes with plans to be open by July 25, just in time for all those anticipated summer workouts. There is also talks of a restaurant moving in to the Shoppes as well, but details have yet to be confirmed. Stay up-to-date on all of the projects happening in Lake Wylie, including the newest construction and commercial developments, and read the full article at Heraldonline.com.